In 2000, M. Night Shyamalan released Unbreakable. A film that was once considered to be a weaker follow‐up to The Sixth Sense is now considered to possibly be his greatest cinematic contribution. The main reason why this change occurred is because it was mis-marketed as a supernatural thriller instead of a realistic take on the early growing Superhero movie genre. Despite the next decade being littered with critical flops, Shyamalan managed to reignite his career last year with successful psychological thriller Split, especially with its reveal that it was set in the same universe as Unbreakable. Now, he has set out to finish the storylines he started in both films and wrap up this trilogy. I wish I could say the result was worth it, but it ultimately is not. Kevin Crumb/The Horde/The Beast (James McAvoy) is at large and is trying to find more “pure” people to consume. He encounters and fights David Dunn/The Overseer (Bruce Willis), who has stayed in the shadows ever since he found out he had super‐strength in Unbreakable. They are soon captured by police and put in a psych ward with David’s friend-turned-enemy Elijah Price/Mr Glass (Samuel L. Jackson), where Dr Ellie Staple (Sarah Paulson) is analysing them and trying to get them to believe that they are just delusional humans. The story starts out very promisingly and seeing where these characters have ended up and how some of them interact is interesting. Despite the lack of action and somewhat repetitive structure, there are many compelling scenes that make up for this and M. Night does at least give us the sense that the story is building to something. However, much of the first two thirds are hampered by how jam‐packed the final act is, resulting in a large chunk of the film just being a build‐up. But again, it still manages to be suspenseful, enjoyable and engaging. The character work with Mr Glass is compelling, as is Kevin Crumb’s. Whenever these two characters are interacting, their chemistry is enjoyable. There are references that tie the films together, along with the continued talk about comic books vs reality being an interesting, if on-the-nose piece of commentary. Though there are ultimately too many characters that the film must juggle, resulting in some getting little to do. Casey Cooke (Anya Taylor-Joy) is back yet is pushed to the side constantly and David Dunn, despite being the lead at the beginning, has the least to do compared to Jackson and McAvoy’s characters. There are other examples of this but suffice to say it feels like the script could have been reworked slightly. The acting and cinematography are also decent if unspectacular. Willis does seem more awake here than in recent films. Once Jackson becomes a player, he does quite well in a conniving villain role. McAvoy is just as fantastic as he was in Split, but his performance does overstay it’s welcome somewhat. There are a lot of creative camera angles, the fight scenes are handled quite well, and the tension-filled music is a treat for the ears. Yet the third act rolls around, and it falls apart completely. A principle character’s plans and motivations are fully revealed, and they make no sense at all. Two twists are thrown out, the first being predictable for fans (yet the film teases it as a huge secret) and the second being both out of place and turning this series into something that feels ultimately minor in the grand scheme. The final scenes with all three main characters just fizzle out, with one being so anti‐climactic it defies belief that M. Night thought it would work. This ending even disrespects the audience by relying on awkward exposition that spells out the themes and plot points insultingly. The very final moments do almost redeem it and serve as a nice close, yet it also makes the bad prior sequences stand out even more. I get M. Night’s intentions, but he might have ruined this trilogy with these choices. 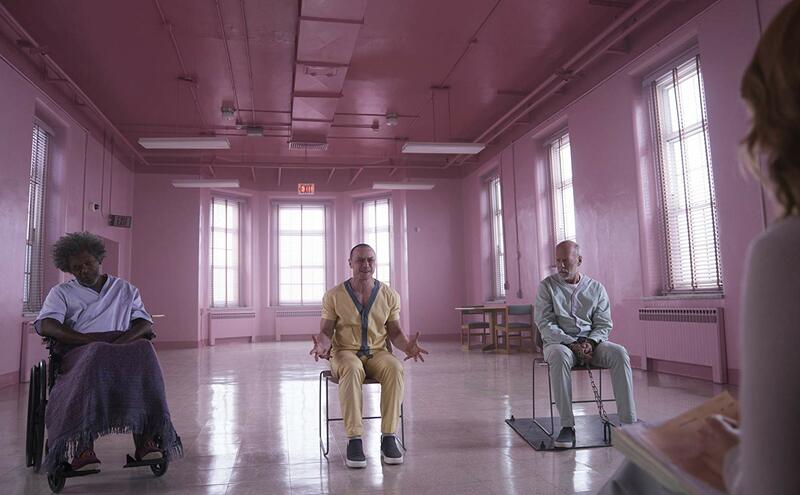 Glass may have some appeal for fans of the previous films and will most certainly divide audiences, but in my opinion, it is a poor conclusion to this trilogy and something that should have been far more satisfying. I wanted to really enjoy it, and I did momentarily, but the terrible ending makes this film a let down overall.